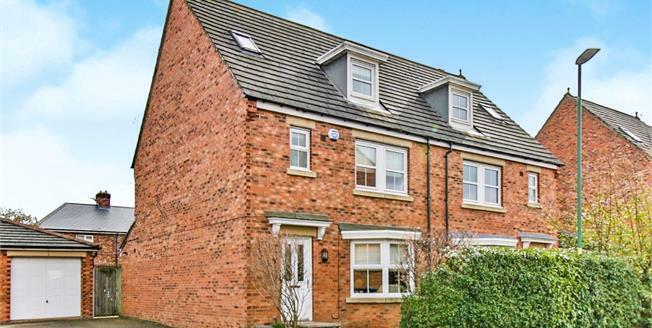 Superbly presented four bedroom leasehold townhouse, on the outskirts and within striking distance of historic Durham City. This stunning abode boasts superb features including four excellent sized bedrooms, large kitchen and dining room, patio doors leading to an immaculately landscaped garden and large walk in wardrobe to the second floor. The semi detached home is marketed with no onward chain and is ideal for purchasers looking for a family home, base close to work within the main cities of the North East, or an investment opportunity for keen Landlords. Neutrally decorated hallway giving access to Living Room and Kitchen/Diner. Storage cupboard with alarm panel. Solid oak flooring throughout. Neutrally decorated and spacious Living Room with bay style window. Hidden electric facilities for TV wiring. Excellent Kitchen and Dining area complete with solid oak flooring, modern fitted kitchen with integrated appliances and patio doors leading to the rear. Kitchen windows are fitted with folding window coverings. Located just off from the Kitchen, with additional storage space and plenty of room for a washing machine and tumble dryer if desired. Modern fitted suite comprising WC and basin. Sizable double bedroom with a front aspect, complete with fitted wardrobe and access to a modern Ensuite bathroom. Modern fitted Ensuite bathroom with contemporary cream tiles, WC, basin and large walk in shower facilities. Neutrally decorated room, ideal as a study space, office or nursery. Well presented family bathroom complete with white suite comprising bath, WC and basin. Stunning Master bedroom located on the top floor, allowing for tonnes of natural light to flood in. Excellent walk in wardrobe area which is already fitted with storage and rails. Velux window is located above, allowing light and privacy. Spacious Ensuite bathroom with standing shower cubicle, WC and basin. Velux window fitted above. To the front is a well presented and low maintenance garden space. The rear has been landscaped to a high standard with contemporary thinking in mind. The patio is complete with recessed lighting, flower beds are well maintained and there is an external power socket and hose pipe. A garden side gate gives access to the detached single garage, and drive way.